The Mike McNamara Group at Coldwell Banker Premier Realty is a Las Vegas-based Real Estate team formed in 2018 by Mike McNamara. Mike McNamara has been a Southern Nevada real estate agent since 2008. The Mike McNamara Group at Coldwell Banker Premier Realty is a full-service real estate team that specializes in buying homes, selling homes, short selling of homes, and real estate investing. Users can search homes for sale in the Southern Nevada market from the website. We strive to create a real estate business where our clients come first and are treated with honesty and respect. We provide a fine-tuned real estate marketing plan with a combination of Internet marketing, professional photos, virtual tours and a highly developed networking system of top realtors. Our team specializes in short sales, buying, selling, and investing here in Las Vegas. The Greater Las Vegas Valley is made up of mostly the City of Las Vegas and the City of Henderson. While many think of Summerlin as another Las Vegas city, Summerlin is like Paradise and Spring Valley, areas that are apart of the City of Las Vegas. North Las Vegas is its own incorporated town. We've created an interactive Las Vegas Zip Code Map to better assist our clients in finding the different areas of Las Vegas. Click HERE to view my past sales, listings, and reviews! Mike was very patient with our numerous questions and answered promptly via text, email or phone. He takes pride in his work and we felt he had our needs and wants in mind for both selling and buying a new home. I had to sell my house from out of state and Mr. McNamara delivered on all promises and more! He had proposed solutions to every problem that arose and gave me as smooth of a process imaginable. Mike is really great, always quick on responding back. When I moved to Las Vegas, I hired Mike to help me find a house and I hired him again when I sold the house. Mike treats you as family. Glad to have realtors like Mike with a lot of knowledge and honest. Mike was incredible to work with! Not only did he work with my Husband and I for over a year on a very specific floor plan but he was direct and honest without overstepping. I appreciate that approach to sales in general. I work odd hours and Mike always made time based on my personal schedule. When we finally found our dream property and closed we had a terrible situation arise just after - Mike has been vital in helping us receive resolution 2 months after closing! I appreciate his professionalism, and his thoughtfulness during our first home buying experience. Thanks Mike! From the Williams Family- Melody, Bryant, Xavier, and Myelle! Mike was the realtor who sold my previous home and the realtor for the purchase of my new home. I haven't purchased a home in over 30 years, so he was good about working with me as I was not real sure what I was looking for. He showed me different options, which helped to narrow down what I did and didn't like. Whenever I had a question about the process, he was always willing to walk me through it. When we found the home I recently purchased, he was able to negotiate and get a price below asking. Although there were minor hiccups that came up during the sale of my previous home, Mike was professional and worked with the new homeowner's agent and was able to close the sale above the appraised amount. Overall, I am satisfied with Mike and the outcome of both houses. he told us. He helped moved boxes from our room to the garage which was a surprise to me. I would recommend him to anyone who wanted to sell their home. Mike is very knowledgeable and responsive. I am very particular with the house we want and Mike was always willing to assist our needs. He only showed us houses he knew would fit our taste; didn't waste our time which we appreciated. He was always available and responded very quickly. He is also helpful not only in the beginning but also throughout the process and after the sale. I would definitely recommend him to all our friends and family. We have bought houses before and he is by far, the best realtor we have had! Mike was very responsive to all our needs. He kept us informed throughout the process and sold our home quickly. Entire process was painless and easy. Will definitely call Mike in the future when we are ready to buy/sell again. Mike was absolutely amazing to work with. He was very responsive to any questions or concerns we had. Our home was listed and sold very quickly thanks to Mike and his team. If you're looking to buy or sale a home I would highly recommend Mike McNamara! Thanks for everything Mike. Mike was amazing!!!! My husband and I moved from out of state and Mike worked extra hours to accommodate our short trip out to look at homes, took time to understand exactly what we were looking for, directed us to the areas of town that matched our likes, and truly had our best interest at heart. If anyone is moving to the Las Vegas area we HIGHLY recommend Mike. He was a pleasure to work with!!! On our first meeting, he walked me through the entire home buying process and answered all my questions. We ran thru a couple of houses so he could have an idea of my taste of houses. He listened attentively to what I was looking for in a house and helped create search parameters /coordinates based on his knowledge of the local area. With his help, I was able to get an amazing house for far below my target price. Mike is easy going and a strong advocate for his clients. I would strong recommend him to anyone. If I buy another house or decide to sell my current house, Mike will be my agent. Great job. Kept in touch with us through the whole process. Also any questions addressed to those involved in our purchase, he contacted them right away then reported back to us. We would definitely recommend Mike McNamara to others. My first conversation with Mike I could tell he knew his stuff. This was my first home purchase and he walked me through exactly what would happen and answered all of my questions. As the process moved along I was able to call, text, email him any questions I had and he would usually respond within the hour. I never felt pressured to buy and Mike truly wanted to make sure that I found the home I would be happy with. He helped me to understand things to look for that I would have never thought of. Mike is respectful, knowledgeable, and knows how the process works. I'm going to keep him on the top of my list should I be in the market again. Michael is the most professional,honest and knowledgeable realtor I have ever worked with. He's not just there to sell you a house, he makes sure it's really what you want and your happy with it and trust me, the majority of realtor aren't that way! He has a team of professionals he works with if you need any work done to you new place,they too are honest. If something isn't right Michael will make sure it get done to your satisfaction. He also is knowledgeable in lending,if you feel something isn't right or being over charged he'll know and get an explanation or reduced. All in all you differently won't be dissatisfied with Michael. Mike helped me find my house quickly and efficiently. Being a first time homebuyer, he walked me through all the steps and never pressured me. He was always available to answer questions. Michael McNamara is nothing short of a miracle worker. My unique circumstances did not allow for the flexible timeline that most people are afforded during the home buying process. I would not be happily living in my home if it were not for his excellent negotiation skills and responsiveness. Aside from these attributes, it was and is still obvious that Mr. McNamara had my very best interest in mind at each stage of the transaction. He was very prompt about explaining any kind of electronic correspondence/documentation that was sent, often times before I even knew I had received an email. I will confidently refer friends and family to him and will certainly utilize his services in the future. My wife and I met Mike through a friend's referral. We are fortunate to have met him. Mike exceeded my expectations throughout the process of our home search in Las Vegas Nevada. We came knowing very little of the local area. Over the course of several arranged trips we viewed many homes and eventually closed on a lovely Summerlin property. Mike anticipated our needs and was available at every turn. Mike seemed to know when to help us out and went to give us the room we needed to navigate the process well. 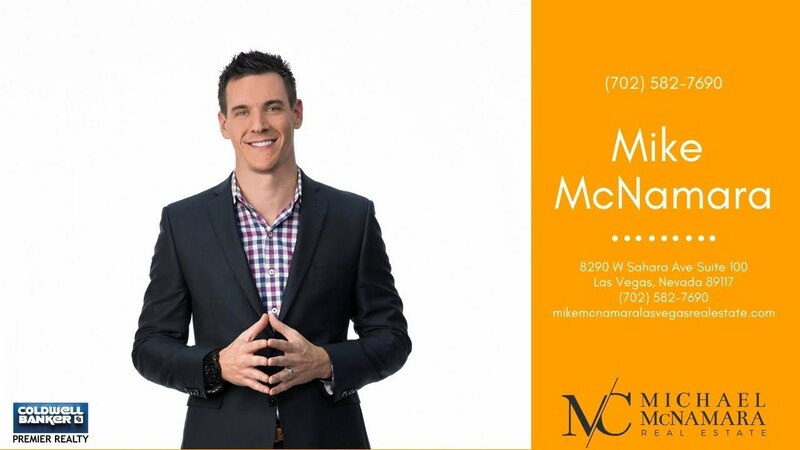 I would not hesitate to recommend Mike to anyone seriously looking to purchase real estate in the Las Vegas area. You will have a hard time finding a more dedicated and knowledgeable realtor. Mike is a well organized, tech-savvy, step-ahead-of-the-game realtor. He made ample time for us on our visits into town for house hunting, even picking us up at the airport and working into the evenings and through the weekend. He was unbiased as well, listened to our needs and concerns and was responsive and swift with our negotiating and closing process. I would highly recommend Mike and use him again myself. Mike was there for me every step of the way. He would always answer my questions honestly. Being that it was my first time buying land he went above and beyond to help me. He took extra time to explain things and he made me feel confident that I was making the right choice for myself. He was consistently on-time, and would follow up with any of my questions immediately. He really cares about helping you and it is much more than just a job to him. I not only had a business relationship but I made a life long friend. I would absolutely recommend him to everyone! Michael is knowledgeable, professional sincere and ethical. He will listen to your needs and work with you to get the best results. I would HIGHLY recommend him. Loved working with Mike!! He made the entire process easy and low stress for me. Mike helped us sell our home quickly while also getting a very competitive/fair price for the home. He is both trustworthy and genuine and felt like he always had our best interest at heart. He is professional, very knowledgable and punctual in appointments or returning my calls. Very personable, listens and genuine in his deliverance. Took time as "out-of-towners" to show us many properties and answers various questions about the neighborhoods and surrounding ones. I relocated from Michigan to Las Vegas and a coworker of mine Recommend it me Michael to help me find a house. He helped me out a lot like he was trying to find a house for himself. Mike called me at least twice a week to keep me informed with new houses and updates. It was hard for us to keep up with everything because of the distance. He even sent us videos of the house after we signed to make sure everything was in order. Highly recommend him to anyone. Best one yet! Michael was very pleasant to work with. His ability to use technology moved the process along much faster than in the past when I had worked with another agent. Something that I appreciate is honesty and he learned who I was, he was on my side from the beginning. Because of this he was able to give me honest feedback on what I could realistically expect. He was great to work with. I would recommend him to anyone. Mike was a pleasure to work with. It was our first time selling a home and I felt extremely comfortable working with him. He was very knowledgeable and honest with us about the market, our home, neighborhood, etc. Mike helped us through the process from start to finish and really made it easy for us. As a busy family it was exactly what we needed while selling our home. I trust Mike and will definitely be working with him in the future. Michael was amazing! He was a professional. He was always on time, he set expectations well, and he guided us through the whole process. He was easily reached and put our needs at the forefront. He made the tedious work of property searches and viewing fun and exciting. Wouldn't have asked for a better realtor! Mike was amazing to work with. I love when you're able to work with someone who is really passionate about their career and it shows in his successes. He followed-up almost daily to check in on us and make sure we had all questions answered. When we did have a question, he responded right away. Mike is definitely an agent that won't disappoint. He even followed-up with us to how the move went. I would recommend Mike in a heart beat to anyone looking to selling their home. Oh and by the way, he sold our home in ONE DAY! Again, you won't be disappointed with Mike. AND a big THANK YOU to you Mike. Thank you so much! We really got lucky to find an agent like Mike. This was my first home buying experience and being clueless on the process of it all, Mike took his time to explain the area of location, knowledge of the industry, or any of the importance of what we needed to be aware of. I appreciated how Mike always followed up with us, returned our messages/calls immedicately, working with our schedule, never hesitated to show us anything we requested. We didn't waste anytime on anything we didn't like. Mike is so processional, I like how promptly advised us know any status on the other end of the seller. I was quite terrified with the paper work process but Mike made it very painless. I've learned so much from him in very short amount of time. During this entire journey I really felt like we built a wonderful relationship with Mike. He made this such a fun experience; we cannot be any happier with our purchase. I highly recommend Mike NcNamara to anyone looking for a realor, I would look no further. He is one call away to helping you find that very next place to call home. Thank you so much Mike for everything you've done for us. I look forward to seeing you at our house warming!! Had a great experience with Mike. Very professional and knowledgable. He returned phone calls, texts and emails promptly. Mike was able to answer my questions or if he didn't have one he researched it and gave me the answer in a timely manner. Always availible for his clients very intune to the market and areas that he is working in. Knows how to prices homes for sales quickly and accurately to get his buyers what is reasonable and fair. Highly recommended, if you not using him as your realtor, you are goning to miss out. Michael Mcnamara has earned my utmost trust and respect. His honesty, professionalism coupled with his attention to details made the sale of my property painless and worry free. I consider him the subject matter expert on his field of profession and I will highly recommend his service to my friends and relatives. Michael McNamara is great! He is the consummate professional and will walk you through the process or buying a home from beginning to end. He was always accessible and makes himself available when needed. This was my first home purchase of a home and had no idea what I was doing. I am thrilled that I had Michael McNamara as my agent. He worked to get me the best property for the best price. Mike made the process so easy and explained all the details that I didn't understand. He is knowledgeable and made himself available whenever I had a question. I would recommend Mike to friends, family, colleagues and would will use him again. Mike is a dedicated real estate professional, who is committed to his client, as well as a smooth purchasing process. This purchase proved to be quite complicated, but he was able to make it smoother with satisfactory results. He has an ability to develop a comfort level with his client and has a thorough understanding of his client's target market area. Thank you, Mike, for your dedication and persistence with this purchase on our behalf. Mike was both professional and accessible. He provided excellent advice regarding preparing the home for viewings and took beautiful photos of the house. I appreciated the fact that he kept me updated throughout the entire listing process via weekly phone calls. Mike was always available to help with and/or resolve any issues or concerns that arose throughout the listing and sale. His confidence and professionalism allowed me to trust him fully, which kept my anxiety over the process to a minimum. Mike was on top of things. He even helped us find outside contractors for painting. Anytime we had questions or needed anything he was very prompt with a response. He always remained in close contact with our builder. Michael is very helpful throughout the process of home buying and understanding of all kinds situations. They say that home buying is stressful...it is but because of different types of situation. Michael as a your realtor makes your home buying process fun and easy. I would highly recommend Michael McNamara to anybody buying a home. Honest, professional, helpful, and knowledgeable in all areas of his profession, Mike has made my first home buying experience fun and exciting. Mike worked really hard to find me the best 'downsized' home possible within my limited budget and within the area of the city I wanted to relocate into. He is also an *awesome* photographer and took wonderful, clean, detailed pictures of the home he helped me sell. Mike helped me and my wife through the whole house selling process. It was a completely worries free experience and I would not use any other realtor if I had the opportunity to buy or sell a home. Because of work reasons, we had to move out of the state, the biggest setback in the relocation process is not being able to find such a good realtor as Mike. Michael was a pleasure to work with. I found him to be "Johnny on the spot" as far as him getting back to me, or dealing with any issue that pops up during the whole process. By far the easiest real estate transaction that I have been involved with. Mike was very professional and extremely helpful in the purchase of our home. He understood the difficult process of purchasing a HUD Home and got us through the process in a very short time. He stay in communication with us and made sure that our purchase was completed without any problems. I have purchased two houses from Mike McNamara; the first to eventually become my permanent residence, and the second as investment property. In each case, I sat down with Mike and explained what I was looking for; and he went out and found exactly what I wanted at a great price. I couldn’t be happier with the home I purchased; and the investment property turned out to be one of the best investments I have ever made. I found Mike to be a consummate professional with a complete understanding of the Real Estate business. The two properties I purchased were a Foreclosure and a Short Sale; and there was no question that he wasn’t able to answer to my full satisfaction. In addition to all this, I found Mike to be a ‘people person’; he makes the process friendly and enjoyable. My Husband and I used Mr. McNamara for the process of purchasing a home. We hadn't purchased real estate in the Las Vegas market since 2004 and with the economic recession and the foreclosure epidemic in our city we really didn't know what to expect. We can honestly say that from beginning to end with Mr. McNamara we had the best experience. He was respectful of our time and listened to all our needs. He has the right amount of balance with letting you look at the websites of homes and making suggestions for your families needs. He checks in with you weekly for all cares and concerns you may have. I also never felt any pressure from Mr. McNamara about deciding on something even after numerous homes sights proved to be not what we were looking for. Mr. McNamara treated us with the upmost respect and courtesy through our new home purchase. We also felt like he was right on top of all issues that could arise and there to help us. He is a young professional that has the knowledge of our community and the professional skills to help make your home buying process enjoyable. He is also a young man with manners and a very strong work ethic. My Husband and I can't thank Mr. McNamara enough for all his help as we navigated these last couple of months waiting the completion of our new home. We have now been in our home just two months and Mr. McNamara still called us to check in and see how everything was going. We really appreciated that. We recommend Mr. McNamara highly to anyone that wants to have a professional, yet personable real estate agent with out all the pressure.